Sold per linear yard by 57" roll width (including selvedge). *The values for breathability (MVTR) above are shown as an indication of the technology and are largely dependent on the construction and fabrics used. Thru-Hiker's first Quality Shield™ sil nylon. Independent tests show Thru-Hiker's Shield "...outperforms all other light sil nylons tested to date, and by a large margin". Price: $11.95 Sold per continuous linear yard by 57" roll width. 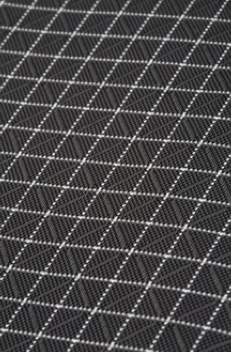 This 210D nylon woven textile contains a white Dyneema ripstop 0.25 in (6.35 mm) grid reinforcement at 0 and 90 degrees. The textile is also coated with a layer of polyurethane (PU flexible layer to give improved abrasion and water resistance). The Dyneema content equals 9% of total fabric weight. Each Dyneema thread is 15 times as strong as steel per unit weight. It has a temperature range of -40 to 255°F (-40 to 124°C), a bursting strength of 328 psi (ASTM D774) and a basis weight of 4.2 osy. It is available in a usable width of 56 in (14221mm) wide and with a nominal thickness of 0.011 in (0.3 mm). The 210d version also has an additional "X" pattern of nylon over weave that improves abrasion and tear-resistance. Color: Jet Black ( ) Sold per continuous linear yard by 57" roll width (including selvedge). Finished weight: 4.2 oz/sq yd (140g/m2). This 140D nylon woven textile contains a white Dyneema ripstop 0.25 in (6.35 mm) grid reinforcement at 0 and 90 degrees. 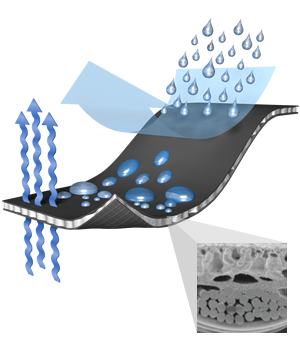 The textile is also coated with a layer of polyurethane (PU flexible layer to give improved abrasion and water resistance). The Dyneema content equals 5% of total fabric weight. Each Dyneema thread is 15 times as strong as steel per unit weight. It has a temperature range of -40 to 255°F (-40 to 124°C), a bursting strength of 277 psi (ASTM D774) and a basis weight of 3.5 osy. It is available in a usable width of 56 in (14221mm) wide and with a nominal thickness of 0.008 in (0.3 mm). Sold per continuous linear yard by 57" roll width (including selvedge). Finished weight: 3.5 oz/sq yd (117 g/m2).